Inside Canvas, go to Admin > Developer Keys. Click the button Add developer key to add a key. In the Key name type in Peergrade. Leave Owner email and Redirect URI (legacy) empty. Copy the URLs below and paste them into Redirect URIs. You might want to expand the textarea to make sure that both URLs are pasted in correctly. The Icon URL input should be left empty. Click Save key. Your developer key is now saved. It will be listed under Developer Keys with and ID and a Key that will appear on hover. We will use the ID and Key in the next step. 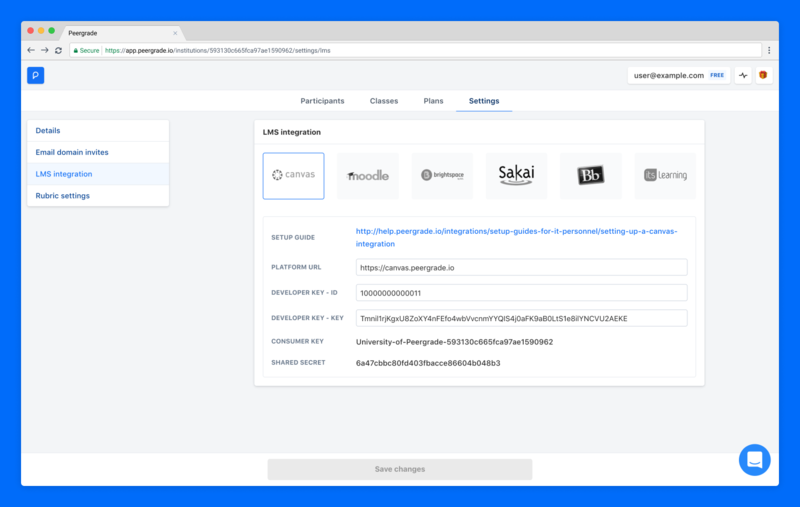 When you've set up your developer key in Canvas it's time to pass the information from the key to your Peergrade institution. 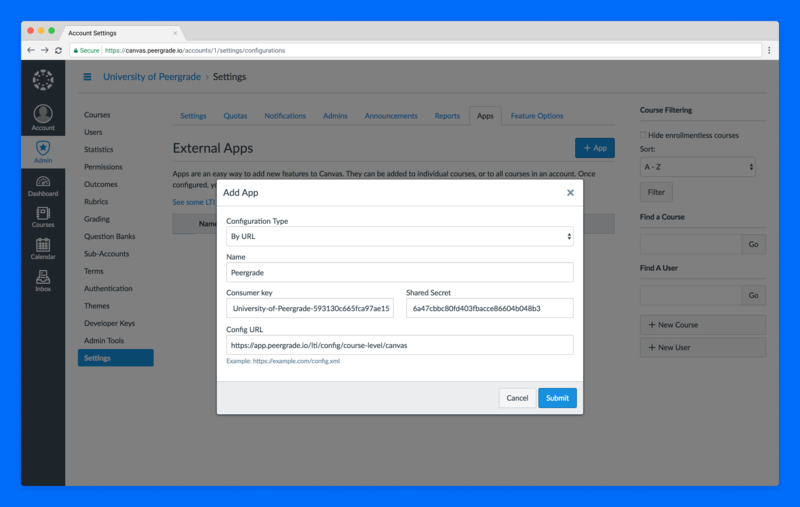 Inside Peergrade, go to your Institution dashboard accessible from the context menu appearing when you hover your name in the top right corner. Go to Settings > LMS integration and select Canvas. Type the URL for your Canvas installation into Platform URL. 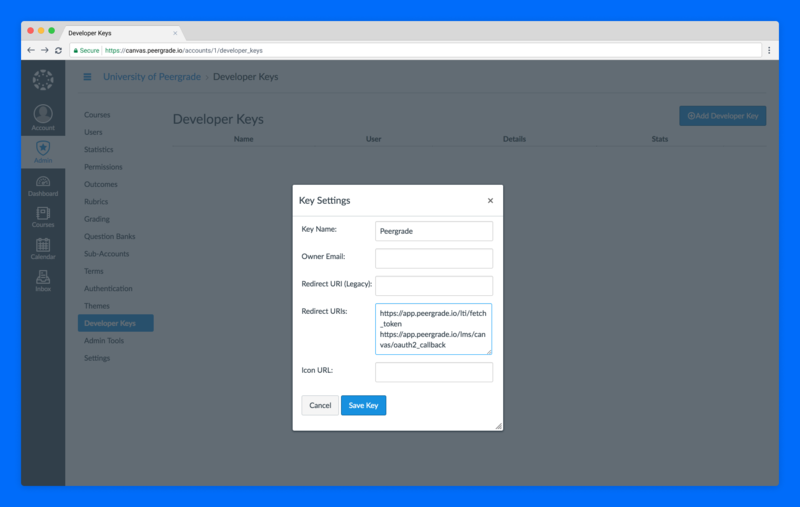 Back in Canvas, copy your ID and Key into Developer key – ID and Developer key – Key. Click on Save changes. Now you'll see that the Consumer key and Shared secret have been generated for you. We will use the Consumer key and Shared secret in the next step. Back in Canvas, go to Admin > Settings > Apps. Click on + Apps to add a new app. Change the Configuration Type to By URL. Type Peergrade in the name input. Paste the Consumer key and Shared secret from Peergrade into the two inputs in Canvas. ⚠️ Important note! Canvas might add an extra space at the beginning of the input when you copy and paste the Consumer key and Shared secret from Peergrade. Make sure to remove the extra space if it's been added after pasting. Add the URL below to Config URL. Now you can share the Canvas LTI integration guide with your teachers and let them know they have access to Peergrade!